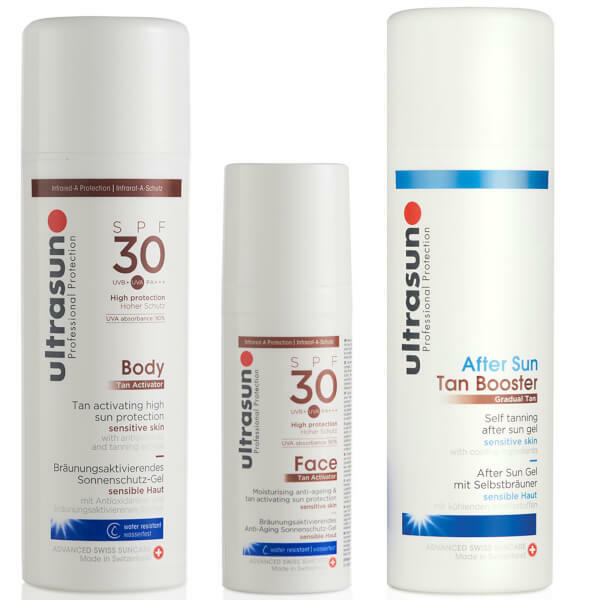 Achieve a safe and natural tan with Ultrasun's Ultimate Tanning Bundle. Combining an aftersun tan booster and a tan activator for the face and body, the kit promotes a natural, golden glow, whilst delivering long-lasting protection and hydration. A hydrating, water-resistant sun lotion that protects skin from harmful rays, whilst encouraging an even and golden tan. Developed with broad spectrum SPF30, the effective sun cream shields the body from UVA and UVB damage, whilst an advanced active ingredient works to activate the tanning process and promote a healthy glow. The hydrating formula delivers a veil of moisture to skin, which restores optimum levels during sun exposure when skin can become particularly dry. Suitable for all skin types, especially sensitive, the lightweight lotion effortlessly glides over the face, absorbing quickly without greasy residue. Helping you to achieve a safe and natural tan, the sun lotion provides broad spectrum UVA/UVB protection, whilst promoting a healthy glow and activating the tanning process. The hydrating formula delivers a veil of protective moisture to the visage, as well as working to reduce the appearance of fine lines, wrinkles and enlarged pores. A soothing and gentle gel formula that extends your tan. Enriched with Questice(R) Liquid, which acts to cool and calm overheated skin, the aftersun lotion helps to replenish vital hydration after sun exposure. Expect comfortable and healthy skin from top to toe. Body Tan Activator: Aqua, Isostearyl Isostearate, Pentylene Glycol, Methylene Bis-Benzotriazolyl Tetramethylbutylphenol (Nano), Ethylhexyl Triazone, Glycerin, Titanium Dioxide (Nano), Bis-Ethylhexyloxyphenol Methoxyphenyl Triazine, Diethylamino Hydroxybenzoyl Hexyl Benzoate, Ethylhexyl Salicylate, C12-15 Alkyl Benzoate, Polyacrylate Crosspolymer-6, Caprylic/Capric Triglyceride, Squalane, Cocoglycerides, Hydrogenated Phosphatidylcholine, Vitis Vinifera Seed Extract, Silica, Dihydroxy Methylchromonyl Palmitate, Alcohol, Cetyl Phosphate, T-Butyl Alcohol, Lecithin, Tocopheryl Acetate, Ascorbyl Tetraisopalmitate, Tocopherol, Diisopropyl Adipate, Ubiquinone. Face Tan Activator: Aqua, Isostearyl Isostearate, Pentylene Glycol, Methylene Bis-Benzotriazolyl Tetramethylbutylphenol (Nano), Ethylhexyl Triazone, Glycerin, Titanium Dioxide (Nano), Bis-Ethylhexyloxyphenol Methoxyphenyl Triazine, Diethylamino Hydroxybenzoyl Hexyl Benzoate, Ethylhexyl Salicylate, C12-15 Alkyl Benzoate, Polyacrylate Crosspolymer-6, Caprylic/Capric Triglyceride, Ectoin, Squalane, Cocoglycerides, Hydrogenated Phosphatidylcholine, Vitis Vinifera Seed Extract, Silica, Dihydroxy Methylchromonyl Palmitate, Alcohol, Cetyl Phosphate, T-Butyl Alcohol, Lecithin, Tocopheryl Acetate, Ascorbyl Tetraisopalmitate, Tocopherol, Diisopropyl Adipate, Ubiquinone. Tan Booster: Aqua, Isostearyl Isostearate, Methylene Bis-Benzotriazolyl Tetramethylbutylphenol (Nano), Pentylene Glycol, Ethylhexyl Triazone, Titanium Dioxide (Nano), Bis-Ethylhexyloxyphenol Methoxyphenyl Triazine, Diethylamino Hydroxybenzoyl Hexyl Benzoate, Ethylhexyl Salicylate, Glycerin, C12-15 Alkyl Benzoate, Caprylic/Capric Triglyceride, Squalane, Polyacrylate Crosspolymer-6, Cocoglycerides, Hydrogenated Phosphatidylcholine, Ectoin, Silica, Vitis Vinifera Seed Extract, Cetyl Phosphate, Alcohol, T-Butyl Alcohol, Lecithin, Tocopheryl Acetate, Ascorbyl Tetraisopalmitate, Tocopherol, Diisopropyl Adipate, Ubiquinone.